There is a huge disparity in the world today between the ‘haves’ and ‘have nots’. Khalaf Ahmad Al Habtoor, a well-known Emirati philanthropist, has drawn up a proposal that aims to make a big impact in alleviating global poverty. The proposal hopes to accelerate the Millennium Development’s goal of eradicating extreme poverty in the world. “We will spare no effort to free our fellow men, women and children from the abject and dehumanising conditions of extreme poverty, to which more than a billion are currently subjected. We are committed to making the right to development a reality for everyone and to freeing the entire human race from want. The United Nations predicts that the world’s population is expected to grow from around seven billion today to 11 billion people by 2050, placing an even bigger burden on global governments and the world’s ever-scarcer resources. While he congratulates some of the worlds richest people who are donating a share of their earnings to philanthropy, like ‘The Giving Pledge’ launched by Bill and Melinda Gates, Al Habtoor says the fight against poverty is not their responsibility alone. 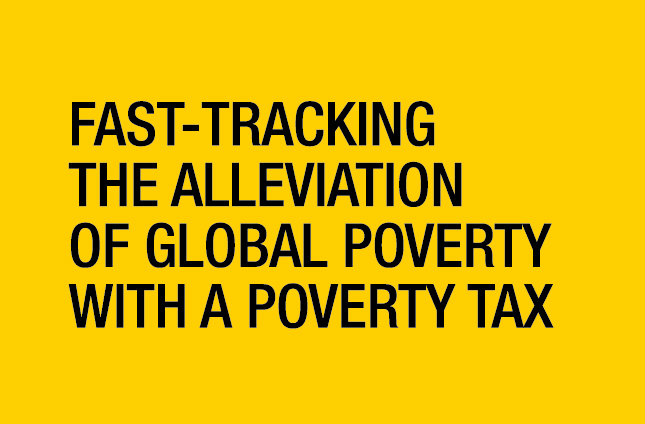 Through his philanthropic foundation – The Khalaf Ahmad Al Habtoor Foundation – he has put together a comprehensive plan that calls on global governments to take an active role in stemming poverty by imposing a ‘global poverty tax’. Al Habtoor calls for a collaborative effort by global leaders to participate in a global system of revenue raising – or poverty tax. His idea is more ambitious that others have proposed in the past. Al Habtoor wants governments to pledge an agreed percentage of their annual tax revenues (suggesting 2.5 per cent) to be handed over to a new independent body, founded and based in a neutral country, tasked solely with global poverty reduction on the proviso that it be immune to political influence and subject to independent auditing.